WARNING: Some people may find the following video graphic. Rescuers from the Wildlife Aid Foundation (WAF) veterinary hospital in Leatherhead, Surrey, are used to being called out at all hours of the day and night to tackle wildlife emergencies - and road traffic accidents involving wild animals are among the most common. So, when the charity's rescue team was dispatched to an RTA in nearby Byfleet on Saturday night the last thing they were expecting was to end up delivering the first fox cubs of 2015 - and the first multiple fox cub birth by caesarian section! Called out to deal with a female fox lying in the road, WAF's senior veterinary nurse Lucy Kells and wildlife rescuer Sean found the animal in a very bad state, with serious head injuries. Says Lucy: "There were seven people standing around the fox in a circle, taking care of her until we arrived. We rushed her back to our veterinary hospital in Leatherhead but she was in a very bad way and she had several fits en-route." As it turned out, she was also heavily pregnant. "Once we got her back to the WAF hospital," says Lucy, "she had another severe fit and had to be sedated so that she could be properly examined. It was then we discovered she was carrying six babies. One of these was very close to the birth canal, and the birth was imminent. The mother was our patient and we had to treat her as the priority, so we stabilized her on a drip and monitored her for the next 24 hours. She had a good night and was very strong in the morning, to the point we were happy to release her that night, which is what we were hoping for, as we only intervene when absolutely necessary; the best outcome would have been to get Mum back out into the wild and let nature take its course, and let her give birth naturally. Sadly, though, throughout the day she deteriorated and went on to have another massive fit at 3 a.m.
"Then we saw on our CCTV system that she was starting to give birth, while at the same time she was showing extremely worrying neurological symptoms; she was twitchy, as if she was about to have another fit. We still didn't want to interfere, hoping for the best at that stage. But, heart-wrenchingly, she abandoned the first baby as soon as it was born, and started fitting again. Having lost one baby we had to take the very difficult decision to do a Caesarean section, in the knowledge that Mum would have to be quietly put to sleep as soon as the babies were delivered. "When a wild animal has to have a C-section, you cannot guarantee that she wouldn't have problems if she ever gave birth again in the wild. When released, there would be no one to take care of her. We could not perform a hysterectomy because, without her hormones, she would be rejected in the wild and have no territory. Added to the fact that she had serious neurological problems, the kindest thing to do was to put her to sleep." After a very critical hour, the veterinary team managed to revive all five cubs. "The next 48 hours will be crucial", adds Lucy, "as no-one can ever really replace an animal's mother. We will be working around the clock, doing our best to hand-rear the cubs and they'll be with us for the next six months, if they make it through the next couple of days." This is the first time the WAF hospital has ever performed a C-section and probably the first example of a multiple fox cub C-section at any wildlife hospital anywhere. 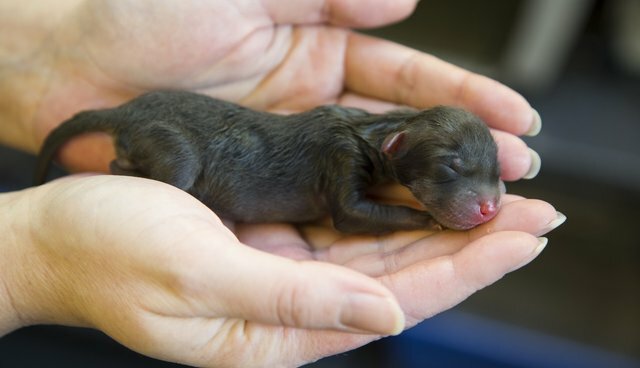 The babies were born full-term; they were not premature. Lucy explains: "A fox's gestation period is seven to eight weeks, which means that this fox will have mated in November. This is unprecedented, as foxes normally mate in December/January and give birth in February/March. So for a fox to give birth in January is extremely early and, perhaps, an indication of how mild our winter has been and how messed up our seasons are nowadays due to climate change. The very worrying thing is that if everything is happening this early and we then get a cold snap, many animals are going to be in mortal danger. If we have snowfall, the mothers won't be able to find food and their babies could freeze to death." WAF is urging people to be vigilant for signs of wildlife struggling and to call the charity for advice if you see anything unusual. Looking back on the emotional rollercoaster of the last two days, Lucy says: "I am incredibly sad and disappointed that we could not save the Mum. From the moment we admitted her on Saturday night she was our absolute priority, but in the last 24 hours the cubs have become our priority and we have had to put our own emotions aside and carry on for their sake. But the feeling, when all five babies started breathing, was indescribable. It has made all the heartache worthwhile." The Wildlife Aid Foundation is one of the UK's largest wildlife rescue and rehabilitation charities. Its veterinary hospital in Leatherhead deals with over 20,000 wildlife incidents every year. The charity works with any and all species of British wildlife. For British citizens: To donate £3 to help WAF care for these fox cubs, text FOX to 70500 or go on our website.